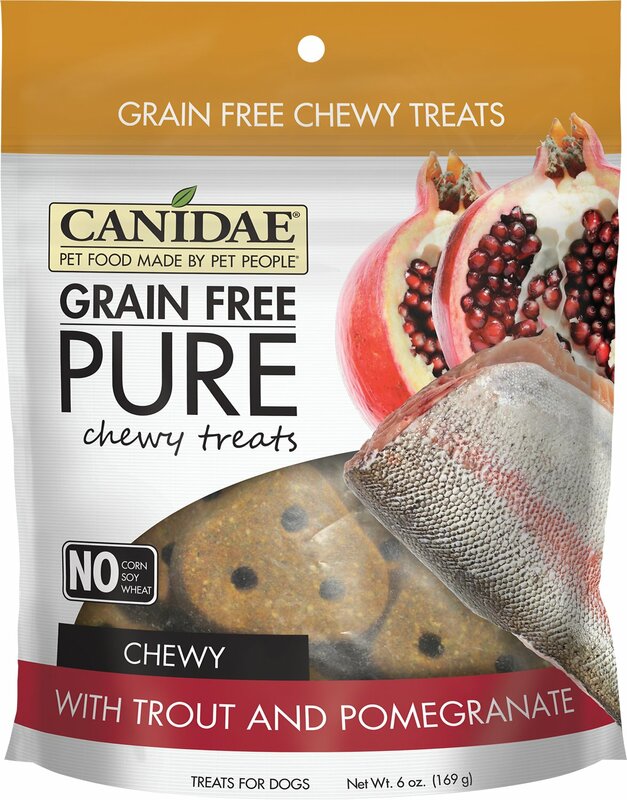 CANIDAE Grain-Free PURE Trout & Pomegranate Chewy Dog Treats were created so that you can reward your canine companion with a healthy treat that tastes great. Made with just a short list of ingredients that are easy to recognize, including the exotic addition of trout and pomegranate, there’s no room for corn, wheat, soy or fillers. And with only 26 calories per treat plus a chewy, soft-baked texture that dogs love, it’s a healthy treat anytime. Made with exotic ingredients like trout and pomegranate. Soft-baked texture that dogs love to chew. Each chewy treat is just 26 calories so they’re perfect for rewarding. Short list of ingredients is free from corn, wheat, soy and fillers. Made in the USA by the family-owned company with uncompromising quality. Treat your dog to these healthy soft-baked treats anytime. 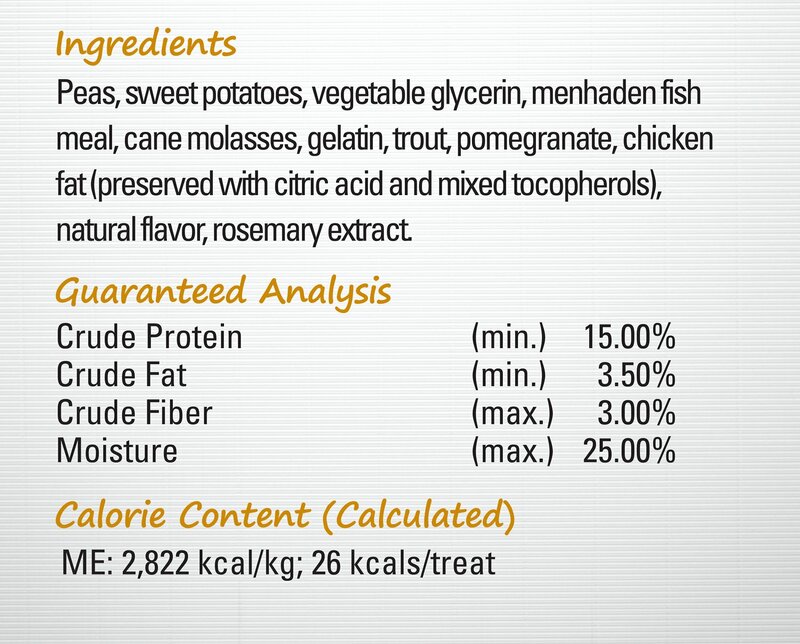 We recommend CANIDAE dry and wet dog foods for a healthy, nutritious diet you and your dogs will love. Treats should not make up more than 10% of your dog's daily calorie intake. These are fine and my dogs like them but they are expensive and the shape does not lend itself well to breaking it apart evenly. There are other healthy treats that are just as tasty and cheaper so I am going back to them. 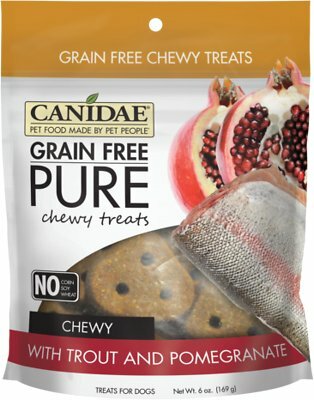 My dogs are very picky eaters, but they absolutely love these treats. My bullie loves these treats. I love that they are soft and easy to break apart. Love the trout and pomegranate combo. Never thought about trout for my dog but she loves it. My 10 lb. dog loves these treats. While they are firm, we can easily break them into smaller pieces. I appreciate having grain-free and chicken-free options since our dog is either allergic or sensitive to both. These are a hit! They can't get enough & since most of my fogs have special food needs because of allergies, these are prefect for them! My dogs loved these treats. I like them because they are soft and can be broken into smaller treat if needed. My dog loves these treat and goes crazy when I open the bag! She takes one bite and then swallows them! Since they are softer my dog doesn't need to chew much! Use it to spike my Bouvier's Orijen Red. Clean's the Bowl.